Take the time to look at the most popular models from a variety of brands. 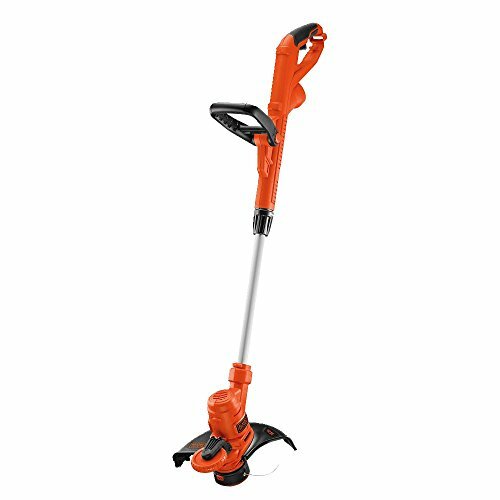 Today, we are going to check out the Black & Decker GH900 6.5-amp string trimmer and edger. This is a two-in-one tool that not only trims your tall grass and weeds easily, but also lets you get in around the edges of buildings, rocks, etc. to make sure that your entire property looks terrific. Many people swear by gas powered trimmers, because they are heavy-duty and they get the job done. But, there are also a lot of people who don’t like to use tools that produce emissions, which is going to happen with any gas powered tool. The GH900 is different, because it uses no gas. Instead, it plugs right into your outdoor electrical outlet, and runs purely on electricity. Another bonus is that along with no emissions, it also is a lot quieter than its gas powered counterparts. FS Automatic System – This is going to keep bumping to a minimum. The PowerDrive Transmission will ensure that there is no bogging down, so you don’t have to keep stopping to while you are working, and you will get the job done quicker. The PowerDrive Transmission ensures that the machine is not going to get bogged down. Ergonomic Design – The ergonomic design of this trimmer/edger means that it is lightweight and easy to maneuver. The shape allows you to carry and use it easily without a lot of muscle strain, and the 14-inch span lets you get a lot more done in a shorter period of time. This is going to come in pretty handy if you have a large yard. ​6.5 Amp Motor – If you want power, you got it! A lot of people think that a corded trimmer won’t have nearly the power as one that is gas powered. This is not the case with the GH900. The 6.5 amp motor delivers high torque, and it is designed to give you an awesome performance. This is the ideal trimmer/edger for most residential properties. ​Height – Many trimmers have one height, and they are not always the best choice for shorter people. This trimmer is adjustable, so just about anyone can easily use it, no matter what their height or arm length is. Because of this feature, you will find that it is easier to use because you can set it up for your preferred length. ​Power Cord – The power cord for this trimmer is long enough that you will be able to reach many areas in your yard. If you need to take it further, you can easily plug it into any outdoor extension cord. As long as you make sure you have plenty of slack, you don’t have to worry about the extra cord making the unit heavier. Easy Conversion – It only takes a few seconds to turn this tool from a trimmer into an edger. You can switch between functions without even having to turn it off first, with the push of a button. This means you don’t have to stop what you are doing to make the conversion and move on to edging after you finish with the trimming. Line Feed – You don’t have to worry about stopping what you are doing to feed the line, because the unit takes care of that for you. The string is self-feeding, so you always have new string when you need it for those tougher jobs that require fresh string for better cutting power. Electrical Cord – Because this unit uses an electrical cord, there is no need for gas that is going to create harmful emissions in the air. And, it is going to save you money in the long run, because you don’t have to keep going out and buying gas for it. Durability – This trimmer is made from durable plastic that isn’t going to rust or wear out over time. You can expect this unit to really hold up when you need it, and as long as you maintain it properly, you can expect it to last for many years to come. Keep the parts well-oiled, and of course, keep it indoors when not in use. Electrical Cord – While we love the fact that this trimmer/edger is electric, some users have complained that they don’t like having to drag an electrical cord around with them while they are working, and that it can get in the way. Like any product, this trimmer/edger is not perfect. But, we think it is a good tool that, when properly maintained, is going to be one of your main lawn care tools for a long time. It is lightweight and portable, easy to maneuver, and because it is electric, it isn’t going to pollute the environment. The Black & Decker GH900 is definitely an option to consider if you need a new trimmer/edger this year. Very inexpensive!